As you enter the Quaker meetinghouse, you are at once moved by the rustic simplicity within. The meetinghouse is divided in half with women sitting on one and men sitting on the other with separate entrances for each. The only sign of any distinction between the congregation are the high or facing seats which are benches raised a step above and facing the benches on the main floor. These seats were reserved for the elders. Because the Quakers believe that the Holy Spirit is immediately present in every soul, there exists a direct source of illumination or “Inner Light” and therefore there is no need for a preacher or minister to lead or teach or mediate for them. The Quaker meeting is marked by silence as each person in his or her own way waits to be moved by the spirit. Meeting may last an hour without a single spoken word. Any person present moved by the spirit may rise and share their message. Any topic is tolerated as they strive to promote the input from the Holy Spirit but limits from the discourse the unacceptable traces of self or ego. The meeting would end. A story of Elder Calvin Shepherd, a maker of wooden boxes is related in Litchfield’s Ancient Landmarks of Pembroke: several children grew restless of the long silent service in which few were moved by the Spirit and began fooling as children will do. Fooling that is until they met the calm and reproving look of the Elder Shepherd. The meeting ended and the boys waited respectfully for the elders to pass but Elder Shepherd paused beside them. The boys expected nothing less than a severe rebuke but the old Quaker looked down with a smile saying, "Boys, thee will see the day when thee will feel serious." 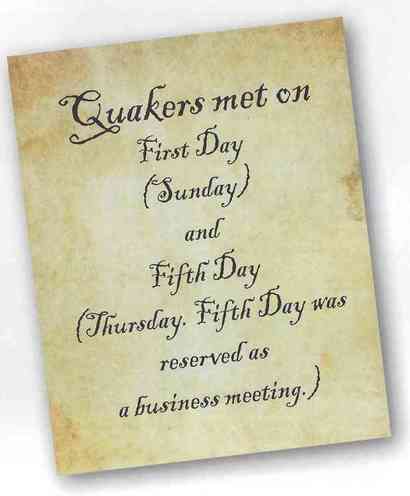 The Pembroke Quakers continued to worship in the meetinghouse until the 19th century when due to falling attendance, the meeting was "laid down" in 1876 and members were transferred to the New Bedford and Sandwich Meeting. The meetinghouse was used sporadically over the next fifty years but ultimately began to show the signs of neglect and was boarded up. In 1929 Horace T. Fogg and Gilbert H. West undertook some badly needed repairs. In 1934, the building was recorded as part of The Historic American Building Survey. 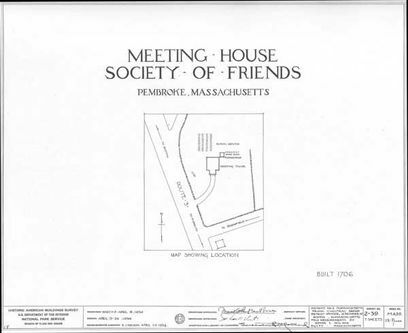 The Pembroke Friends Meeting Association was formed and that group held ownership of the property until 1974 when it was deeded to the Pembroke Historical Society with its future preservation vested in the Town of Pembroke. From 1964 until1979, the meetinghouse was used occasionally by the Cambridge Monthly Meeting. In 1988, with a grant from the Massachusetts Historical Commission and the Town of Pembroke, the meetinghouse received its first substantial restoration in 135 years. Finally in 2006, the Pembroke Friends Meetinghouse was placed on the National Register of Historic Landmarks, exactly 300 years from the time it was first constructed on top of the hill in North Pembroke above the North River. Reader would’st thou know what tru peace and quiet mean; would’st thou find a refuge from noises and clamours of the multitude; would'st thou enjoy at once solitude and society; would'st thou possess the depth of thine own spirit in stillness, without being shut out from the consolatory faces of thy species; would'st thou be alone, and yet accompanied; solitary, yet not desolate; singular, yet not without some to keep thee in countenance; a unit in aggregate; a simple in composite: .... come with me into a Quaker Meeting. Dost thou love silence deep as that "before the winds were made"? Go not out into the wilderness, descend not into the profundities of the earth, shut not up thy casements; nor pour was into the little cells of thy ears; with little-faith'd self-mistrusting Ulysses ... Retire with me into a Quaker Meeting. a unit in aggregate; a simple in composite: .... come with me into a Quaker Meeting. Dost thou love silence deep as that "before the winds were made"? with little-faith'd self-mistrusting Ulysses ... Retire with me into a Quaker Meeting. Click here to continue to "Epilogue - Solving the Mystery of the Move"